For those of you who are caught up not aware of the new developments taking place in Zoho CRM, this article provides you with insights on the features and enhancements in Zoho that you should look out for the 3 left quarters of 2017 and beyond. The enhanced features of Zoho enable your business to integrate multiple communication channels such as email, phone, social media, chat tools and face to face conversations with your customers. The communication history with each customer is automatically saved and maintained as a separate log for increased service efficiency. 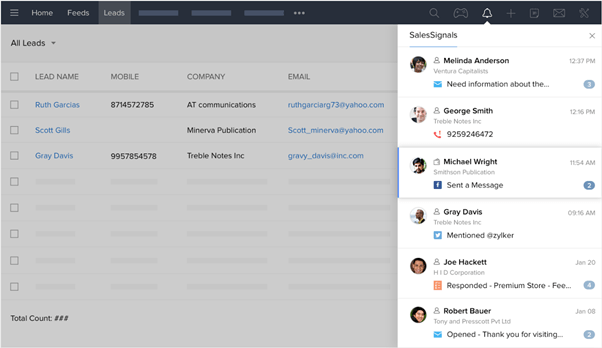 Service reps can use these logs to connect more effectively with their customers, understand their expectations and preferences from the communication history logs without the need to jump from one communication app to another. Your business can now benefit from real time notifications generated whenever your customer interacts with you or engages with your product. So, whenever your customer makes any reference to your products or services on social media or whenever they fill out a survey form uploaded by you, the app notifies you immediately. The app covers all points of contact with the customer – making you smarter in responding to your customer needs. That’s even more to it – you can receive these alerts on your smartphones as well. The enhancements introduced in the Zoho CRM include email analytics that enable you to receive customer action updates whenever you send an email to your customers from the CRM app. 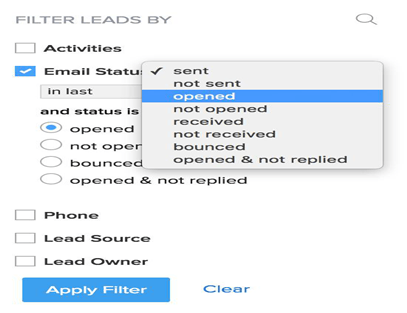 This allows you to get updates on whether the email you sent was received by the customer, or it bounced back and if the customer opened the email once they received it. The Email Analytics feature enables you to create and store multiple email templates that can be used to send informative content to your customers. You can use the analytics feature to evaluate the impact of each of these templates depending on the customer response recorded on the receipt of each template. This enables you to decide which template and content type works best for your business. 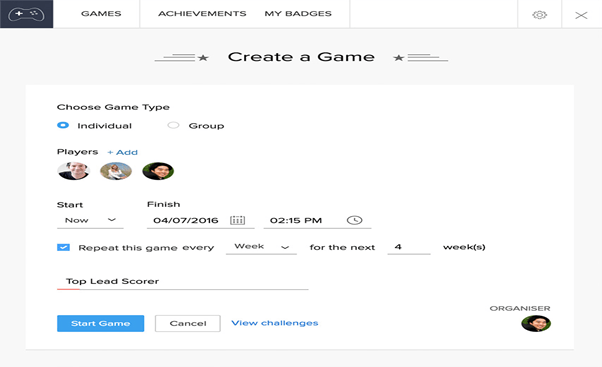 GameScope is one of the most thrilling features introduced by Zoho this year that helps setup gamification in the form of sales contest games for individual sales reps or between different sales teams. You can outline the game rules, targets, and rewards applicable for scoring and winning game points. This is an effective means to ensure that your sales teams are engaged and motivated enough to perform well. Zoho CRM now enables you to integrate efficiently with third-party tools and apps in order to improve productivity and performance of your sales teams. You can now synchronize a range of third party apps to increase efficiency and streamline the flow of information from different sources. Zoho supports multiple other features that improve the functionality of the entire CRM and the connected systems. These features include the use of advanced search filters to search for specific data, customized dashboards for easily accessible vital information, flexible report formats that enable stronger decision making and deep insights, and a lot more. If you are looking for a cost-effective CRM package that supports the core functionalities needed to boost your sales and service performance, Zoho is a great choice. We at Signity Solutions understand the needs of your business better and have the expertise to customize Zoho CRM features for a streamlined performance. Drop us a line at info@signitysolutions.com to get more information about deploying the enhanced Zoho CRM to meet specific business needs.